Most people have heard of Pearl Harbor, especially after the Hollywood movie of the same name came out. Yes, The film in which the charming Kate Beckinsale plays nurse Evelyn Johnson. But I’m sure you’re familiar with that blockbuster. Everybody in Hollywood seems to drink, smoke, snort a few, get married and divorced, and then all of the sudden they’re running across a field in the midst of explosions, pursued by evil Japanese pilots in the cockpits of their Mitsubishi A6M Reisens. Pearl Harbor cost the people of the United States dearly. On December 7, 1941 the Japanese sank four American battleships, two destroyers and a minelayer. Another four battleships, three light cruisers and one destroyer suffered serious damage. The US military lost 2403 people killed and 1178 wounded that day. Even though America’s aircraft carriers were out of reach of the Japanese strike group (three were out to sea and one was undergoing repair in California) and avoided attack by enemy aircraft, the Japanese Navy in one day’s time gained a solid advantage over the US Navy. They got mastery of the sea on the first day of the war. Thus, they were able to carry out large-scale offensive operations in the Philippines, Malaya and the Dutch East Indies. President Roosevelt instructed the War Department on February 19, 1942 to intern all of the Japanese then living in the United States in concentration camps. American towns and cities were plastered with a standard poster: “Instructions to All Persons of Japanese Ancestry… All Japanese persons, both alien and nonalien will be evacuated from the above designated area by 1200 on [such-and-such a date].” They were limited to the amount of baggage an individual or a family could carry in their hands. The Japanese, or those the US government considered to be Japanese, were forced to sell or abandon their property and be escorted to 13 concentration camps in remote areas with terrible climates and living conditions. They were held in the camps until the war’s end. The most shameful aspect of the story for American democracy was that 78,000 of the 112,000 deported were American citizens. The Japanese air raid on Pearl Harbor had another terrible consequence. I can hardly go wrong by saying that the psychological trauma to American society caused by the attack on Pearl Harbor gave it the moral right to justify the use of nuclear bombs on Hiroshima and Nagasaki. There is another small detail to the story which, on closer examination, influences our thinking. 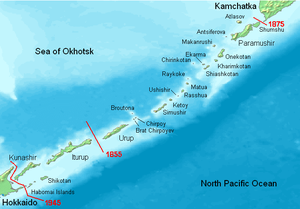 Lots of people are familiar with the tragedy at Pearl Harbor, but few know about that the Japanese squadron given the mission of attacking a major US Navy base in the Pacific Ocean was fitted out in Kasatka Bay on the coast of the Russian island of Iturup (Kuril Islands). Yes indeed, that is one of the Russian islands that Japan is now so eager to acquire. What makes them so passionate about it? Could the Japanese government be planning to again fit out a squadron in Kasatka Bay to attack the US naval base in Hawaii in the near future? Of course, such an idea today, when the Land of the Rising Sun is a US protectorate, is absolutely ridiculous, if not delusional. There is no evidence for any kind of organized national liberation movement among the Japanese people today. I do have one question, however. Can we be certain that America’s hegemony over the world will last forever? I don’t think we can. The political and economic situation is changing very rapidly at present. Japan should be aware that once a people has accepted one foreign authority, it can accept another—China for example. Why not? There were Soviet military airfields in Poland during the Soviet era. Now, the US Air Force is using those bases. Poland easily switched from one master to another, and who would argue that Japan won’t do the same if American influence in East Asia wanes and Chinese influence there grows irresistible? The problem is that in the interval between bosses Japan will left to its own devices, and no one can guarantee that it won’t try again to become an empire and mount another attack on Hawaii. Nobody can guarantee that what happened once won’t happen again. But what is the significance of the Hawaiian Islands? In addition to being the 50th American state, Hawaii (“The Aloha State”) is also a major transportation hub in the northern Pacific Ocean connecting the United States and Canada to East Asia, the Philippines, Australia and New Zealand. Hawaii is located in the heart of the Pacific Ocean. So there’s no mystery about why the United States government decided in 1908 to establish its central Pacific Ocean naval base and headquarters there. This fleet has as its area of responsibility the Pacific and Indian Oceans from the US coast to the eastern coast of Africa. Of course, Japan will never again dare to encroach upon the holy of holies of America’s great empire, on which the sun never sets. Or “never” in the sense of “unlikely.” But would Russia, which now owns Iturup Island, perhaps dare make a try for the US holy of holies? God forbid. Russia couldn’t hatch aggressive plans against the global champion of human rights, freedom and democracy, and everybody knows it. In an extreme case, Russia might launch two or three ballistic missiles towards Pearl Harbor, but Iturup Island would be of little use in that effort. In order to use Iturup Island as a support base for a fleet threatening the peace of American human rights defenders in the Pacific Ocean, Russia would need to make a few political and military decisions. It would have to recognize the United States as a threat to the Russian Federation and adopt a program to build modern nuclear aircraft carriers. And so long as those carriers don’t exist, there can be no question of a Russian threat. The current Russian Pacific Fleet bears that name for reasons of tradition. Once the Minsk and Novorossiysk aircraft carriers were sold to China for scrap, Russia no longer had a Pacific Fleet. It does have a number of submarines, which are mainly deployed at Kamchatka bases from which they sail into the ocean. As for the Pacific Fleet’s surface ships, we would be hard put to say they’re equipped to carry out blue-water (i.e., strategic) missions. The problem is that there simply is no Russian threat to US naval supremacy in East Asia, nor will there be one in the near future. But there is a Japanese and American threat to Russia, and it isn’t hypothetical; it’s obvious. 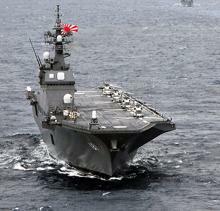 The capabilities of the Japanese Navy alone currently exceed those of Russia’s Pacific Fleet. For example, the Japanese Navy has two of the newest Hyuga and Ise class helicopter destroyers, which entered service in 2009 and 2011, respectively. What newly built ships have been commissioned into the Pacific Fleet over the last 10 years? There is one other subtlety. The term “helicopter destroyer” means little to the public, especially when its owners to seek to portray it strictly as an anti-submarine ship. The problem is that these “anti-submarine” ships can easily accommodate a division of marines, and on top of that they function as strike group leaders. So Japan has two advanced helicopter destroyers. What does Russia have to put up against them? I’ll speak bluntly. Suppose the Japanese government decided to take the Kuril Islands by force. Can we be sure the Russian government would respond by launching a few ballistic missiles against Tokyo? That is, would the Russian government decide to start World War III over four clumps of land even if there are lots of tasty fish swimming in adjacent waters? I’ll explain. I’m talking about a thermonuclear war and the destruction of Japan and the United States. Alas, the nuclear hammer is no way of solving back-fence squabbles with neighbors whose intelligence is clearly inferior to their aggressiveness. What can we do? The Russian Federation has enough money now, but, unfortunately, it has very little time. Things are the way they are. We can pull our hair out all we want, but fact is fact. For the Russian Navy time is flying as fast as a Tomahawk missile, and with the same result. From where I stand, therefore, the Russian government’s decision to buy Mistral helicopter carriers from France and send the first two ships to the Far East looks entirely justified. The Lenta.Ru news agency reported on that a year ago. It quoted Deputy Defense Minister Vladimir Popovkin as saying the Russian Defense Ministry intends to use the Mistral class amphibious assault helicopter carriers to protect the Kuril Islands and Kaliningrad Province. In extreme cases, the ships will support a large-scale troop movement to those regions. “We feel the issue with the islands in the Far East is settled, but the Japanese don’t,” said Popovkin, adding that we have “to keep thousands of soldiers, officers and weapons” in the Kuril islands. It is particularly noteworthy that the official negotiations to buy the Mistrals began on March 2, 2010, but overtures had been made even before that, at least as early as 2009, i.e., the year in which Japan commissioned its first Hyuga class helicopter destroyer. Also noteworthy was the wild howling and gnashing of teeth from the Russophobic public in the Russian-language segment of the Internet when the public got it on good authority that Russia is buying the Mistrals. Various kinds of representatives and public organizations modestly referred to as “institutes” and “academies” from God knows where began foaming at the mouth with arguments about how sending the Mistrals to the Far East is a load of rubbish and blah blah blah. There has been an unpleasant trend throughout the islands’ entire history of the islands, especially in light of what occurred 70 years ago. Under the uproar over the lost “northern territories” and other insults and threats, the Japan Self-Defense Force has now become a fully functional military. Japan’s military budget in 2010 reached $54.5 billion. Japan’s defense spending is now the fifth (!) highest in the world, and it has overtaken that of Germany, for example. Another nuance is that Japan’s naval development will not end with the Hyuga and Ise class helicopter destroyers. One way or another, Japan will get US agreement to add full-fledged aircraft carriers to its navy. What then? What happened once, could very well happen again. The prospect of Russia and Japan staging World War 3 over Iturup seems very unlikely to me, I mean the Japanese attacked Pearl Harbour to initially warn off the Americans. Seeing the amount of devastation that attack caused, with Japanese Americans being evicted out of their homes, it is hard to imagine that any country would attempt to repeat Pearl Harbour any time soon. We have to remember that nowadays things aren’t as black and white as they may have been 70 years ago; multiculturalism is in effect now more than ever. Any country about to stage an attack on another would be forced to sit back and think of the implications the attack would have on its citizens living in other countries; look at the negative effect that America’s war in Iraq has had, not only on Iraqi’s living in other countries, but Muslims, Human Rights organisations, etc. Anyway, great article! I just watched Pearl Harbour yesterday and the stupid love story aside, I actually enjoyed the movie so I thought I’d do some background research. Thanks!